I agree. Looks like I will have to tear it down and give it some proper love. Grauws right. And buying a MFR or something similar will not be a lost, if you're going to upgrade. There are tons of good games available for your Casio. 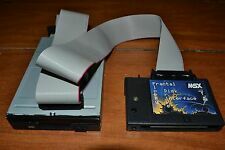 You can even connect your phone and load some .wav files via the tape port. Well I ordered the sd cart form 8-bits forever. Sure it will take a few weeks to get here. My cassette cable should be here soon. So whats a good 16k cas game to give a try? Sorry, I wouldn’t know that, don’t think there are many. Unfortunately you can’t search by memory requirement on generation-msx.nl… Did you receive Popolon-fr’s 1M expansion yet? In that case you should be able to load the ROM games I mentioned earlier via MicroWAVer or maybe some Android apps (never tried either personally but heard about them). Well surgery on the PV-16 when well. The keyboard is now fully working like new. Not sure about the joypads yet. Yay!! No I'm still waiting for the Popolon 1M to come by mail. It's coming from France to the US, so long trip. Hopefully all the parts will come soon so I can give it a proper testing. For me Casio's MSXs becomes a complet MSX1 only with them dock. Without dock they are very small machine but they are not interesting (compared to other MSX1s). If anyone has a tip to add the sound-in pin to the slot cartridge, that would make these MSXs a little more interesting. i had one. but i got to big hands for this msx. nice small. nice to play games when you got a version with good pad. Werner Kai had fix the Sound In of my PV-7. AFAIK it only needs to soldering an resistor to have the sound working. Probably he can help with that. The PV-7 is a good MSX to have at work desk, it have a small footprint and, together with MFRSCC+SD 512KB it can play almost all MSX1 games, including MegaROMs.